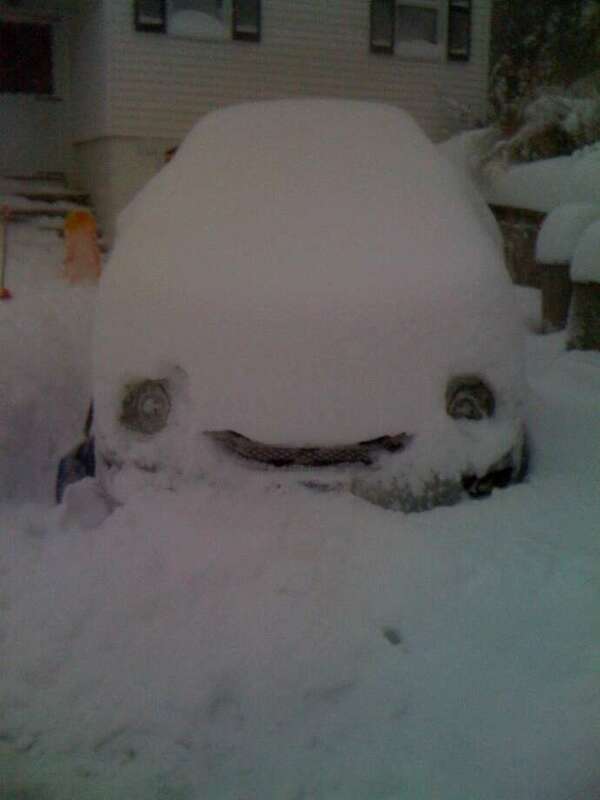 Eric Newman sends us a photo of his car that was happy to get the day off. A car is trapped in a snow bank Wednesday morning on Reef Road in Fairfield. The early morning snow was piled on Judd Street in Fairfield on Wednesday. Accumulations could tally up to 2 feet by time the storm eased. A towering pile of snow is left Wednesday morning by clearing operations in a corner of the Fairfield Railroad Station parking lot. An unidentified man clears off his car at the corner of Stillson Road and Black Rock Turnpike in Fairfield on Wednesday. It may be "Permit Parking Only" at the Fairfield Railroad Station on most weekdays, but Wednesday the piles of snow up to 2 feet deep permitted no parking at all. Fairfield's Post Road business district had snow piled high on both sides of the busy thoroughfare after snow-clearing operations Wednesday. Two hardy shovelers on Ruane Street in Fairfield brave the elements as snow piled up Wednesday morning. Evan Conway clears the lot at the family service station, Conway's Irving on Black Rock Turnpike in Fairfield on Wednesday. A snow-choked Paul Place, off Oldfield Road, in Fairfield shows the 12 inches of snow that had accumulated by Wednesday morning. The snow and sunset create a serene scene in Westport on Wednesday, January 12, 2011. The overnight snow continued to fall Wednesday morning. Accumulations could tally up to 2 feet by time the storm moves past, making it a big job to clear cars like this on on Reid Street in Fairfield. After more than a foot of snowfall, Roxanne and Joseph Angrisano clear their driveway on Brookside Dr. in Fairfield, Conn. on Wednesday Jan. 12, 2011. Mark Morehouse adjusts his snowblower as the wind blows the snow around his Judd St. driveway in Fairfield, Conn. on Wednesday Jan. 12, 2011. Mark Anastasio flys over a bump in the hill at Sturgess Park in Fairfield, Conn. on Wednesday, Jan. 12, 2011. Steven Zembruski flies over a bump in the hill at Sturgess Park in Fairfield, Conn. on Wednesday, Jan. 12, 2011.